Sat., Aug. 18, 2018, 2 p.m. If you think you need a lot of space to grow a productive garden, take a lesson from Andy and Margaret Smith. 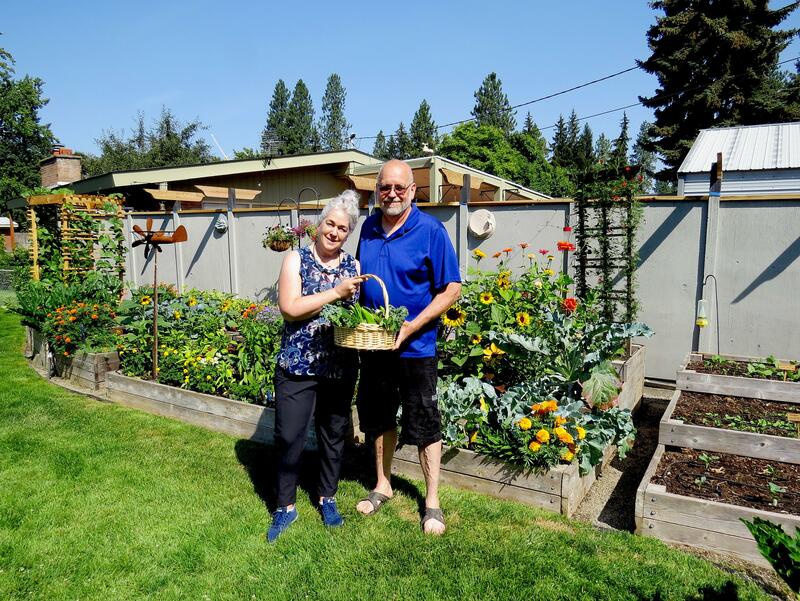 Residing on a city lot in northwest Spokane, this couple has 14 bountiful raised beds and enjoys sharing their excess produce – and gardening skills – with their community. When they married several years ago, the Smiths started transforming the backyard into a food factory. Andy Smith’s woodworking skills have come in handy for building the beds, trellises, a greenhouse and even the garage. The beds are spaced about 16 inches apart, which the couple find sufficient for tending them, and they range from 11 to 22 inches high. The couple have come up with an equitable division of labor in the garden: He starts the seeds, plants and tends the seedlings, and she deadheads the spent flowers, weeds and harvests. If an insect problem comes up, they deal with it using organic methods. This year, aphids have been the most challenging for them. During a recent visit, I particularly enjoyed seeing the diversity of the vegetables they’re growing: potatoes, pole beans, zucchini, broccoli, peppers, kale, tomatoes, Brussels sprouts, carrots and eggplants. They’ve mixed in herbs, sunflowers, marigolds and zinnias along with a red-flowering vine (cardinal climber) to attract hummingbirds. As Andy Smith pointed out, they pick produce daily from their garden from April to late October. But they don’t keep it all to themselves. Margaret Smith enjoys giving baskets of produce to others. The morning of my visit, she had artfully filled a basket that they planned to deliver to a friend. It contained a captivating mix of kale, zucchini, peppers, tomatoes, beans, garlic, eggplant, carrots, herbs and blackberries. The generosity of the Smiths goes beyond those thoughtful baskets, however. While it was enjoyable walking through the Smith’s impressive garden, knowing they understand the importance of giving back to their community by sharing their harvests and talents was especially heartwarming. Published: Aug. 18, 2018, 2 p.m.